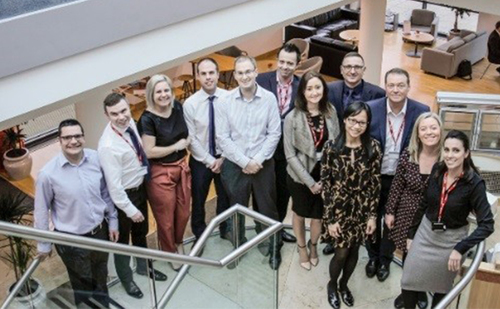 March 2018, Mayflex, the distributor of Converged IP Solutions, has recently seen a team of staff from across the business complete a 12-month Talent Development Programme (TDP). The Mayflex TDP started in early 2017 and was completed in February 2018. The programme which will run with a new set of candidates throughout 2018-2019, looks at developing individuals personal and business knowledge recognising that not all development is focused at heading towards an ultimate goal of becoming a manager. 6 delegates from a range of departments across the business attended a series of workshops covering strategic leadership, applied finance, Sonepar management training and presentation skills as well as participating in team building events, a volunteer day and completing a group project to present to several company directors. All of this ran alongside individual mentoring sessions with a company director. Clare continues, “Well done to all involved on the completion of the programme. We look forward to seeing each member of staff continue on their development journey”. The TDP is one of the many initiatives that have been introduced at Mayflex to ensure employees are given the opportunity to develop and grow their knowledge and skills within the business. Running alongside this Mayflex is also launching a new Wellbeing initiative, to encourage and recognise the importance of health and general wellbeing on employee engagement.